July 4th, 2015 Celebration Event! HomeBlogPast EventsJuly 4th, 2015 Celebration Event! 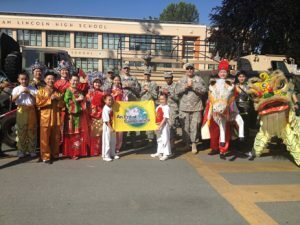 Members of the California State Military Reserve join with parade participants prior to the start of the San Jose Rose, White and Blue parade. 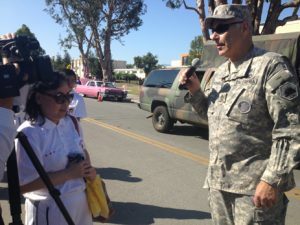 The military does respect love and peace… but by the same token, they’re here to protect the country and the world.” says Mike Frangadakis, Veterans Foundation Founder in an interview with local reporters. 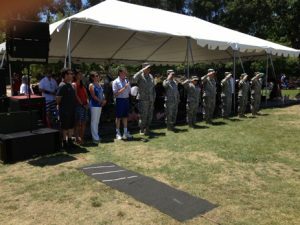 Major Ted Albright, Veterans Foundation Founder Mike Frangadakis and additional members of the California’s State Military Reserve join Santa Clara County Commissioner Mike Wasserman, Los Gatos Mayor Marcia Jensen and members of the Los Gatos Town Council in the Los Gatos tribute to our flag ceremony at Oak Meadow Park. 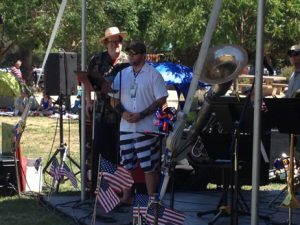 Veteran Ryan Hall who recently returned from his fifth deployment to the Middle East and now serves veterans in the local VA addresses Los Gatos audiences at the July 4th Celebration at Oak Meadow Park. 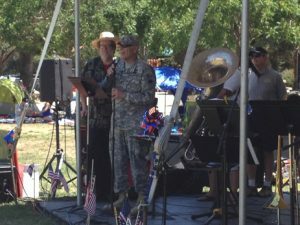 Veterans Foundation Founder Michael Frangadakis shares with the citizens of Los Gatos the importance of a memorial.